So- this past monday was D's birthday. YAY! I am always looking for something fun to do for him... but you know... as you get older... its harder and harder to come up with new ideas. When he turned 30- I did a whole theme of "30 presents for someone turning 30" That was a tough one... its hard to come up with 30 presents a 30 year old would like... with out going broke. And of course a shamless plug for them... if you havn't checked out Seven Shades of Grey yet, you are missing out. They have some new video on their YouTube page. Ok ok... back to the craftyness. So- basically... 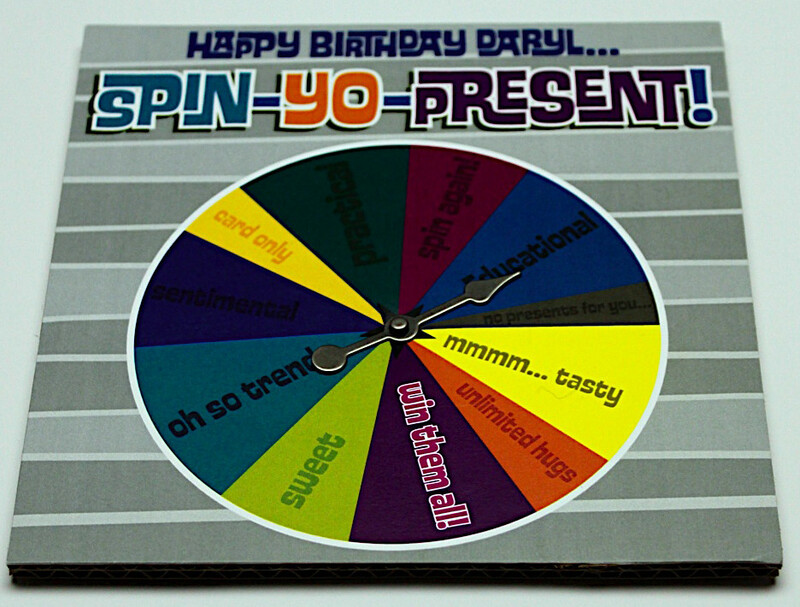 I made a birthday present spinner. Spin-Yo-Present! The premise is... D will spin to determine what he will get for his birthday. The spinner only had describing words, so- the actual presents were still a mystery (wrapped in sushi-pack wrapping paper). If you have yet to see the sushi pack cartoon, I highly recommend it... mainly because they are sooo cute. Little did he know that his card that he will open last will tell him that he has won all of the presents... sneaky. 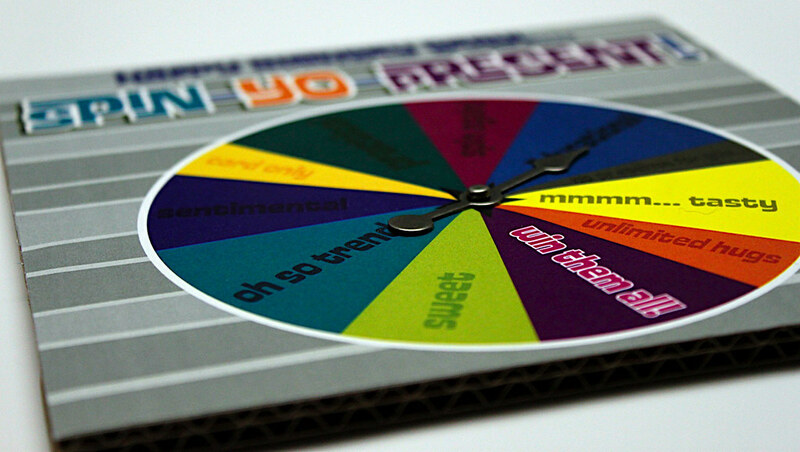 I designed the wheel, and printed it out on cardstock. I then glued it to a thicker piece of cardboard (I used a side of a box I received his presents in). Once I glued it down, I trimmed the edges to a nice neat square. Then, I added the spinner. I purchased these game piece spinners from amazon.com. The package comes with a variety of sized spinners, and matching brads to attach them. This... was the tricky part. I wasn't really thinking when I mounted the game to the thick piece of cardboard that the brad wasn't going to be long enough to poke through to the other side.... so- with some finagling, I managed to squish the cardboard down slightly in the middle and poke the brad through. I will know for next time to pick a slightly thinner piece of cardboard. November is always a crazy birthday month. I am apparently surrounded by Scorpios. Sort of scary... But. Happy Birthday to you all anyway.